For kids, summer is that magical time of no books, no assignments, no early mornings and no state assessments. They come into this blessed season, anticipating sleeping in, swimming all afternoon and if they wish really, really hard, going on some fabulous trip to some fabulous place. All expenses paid by the parents, of course. For dads, summer can be that not-so magical experience of little time off, little reprieve from assignments, little chance to sleep in, and little chance of not feeling constantly assessed. We always question our parenting, but never more so than during the good old summertime. The pressure is on to keep up at work, and provide memorable experiences for our children, as well. While there may be times in which we can take our kids on what we deem “real vacations,” there are many other times when that may not be possible. Of course, a trip to see Mickey Mouse is going to stick in your child’s memory, but so is a water fight in the backyard. Some activities are dictated by geography, I am well aware of that. My family lived all over the country, and even in the Republic of Panama, so we had times where a trip to the beach was a cheap and easy memory to make. Other places we lived, just getting to a small lake was both time and money consuming. As our boys grew older, time, money and geography were joined by Little League and camp schedules. Planning “ultimate summertime experiences” became anything but, "fun in the sun." I don’t envy the young parents in this age of social media. Scrolling through endless pictures of endless summer bucket list check-offs can be depressing for the father who is working 60-75 grueling hours a week just to put a hot dog on the rusty, 20-year-old charcoal grill in the overgrown backyard. But, a $5, half-hour water balloon fight in that weed-filled grass could provide a memory for your kids that sticks with them as long as any meet and greet with The Mouse. Now, there is nothing wrong with taking a lavish trip when given the opportunity, but don't forget that lavish love is really what our children crave the most. And that, fellow dads, is truly magical. I encourage you, today, to take the opportunities that are right in front of you - whether big or small - to make summer memories that last a lifetime, for both you, and your kids. Oh, and don't forget the sunscreen! Summer time: school’s out, the kids are home. It’s time to travel, take vacation, hit the beach or swimming pool, and see a few ball games. Iced tea and lemonade tastes better when served 1 degree above frozen. 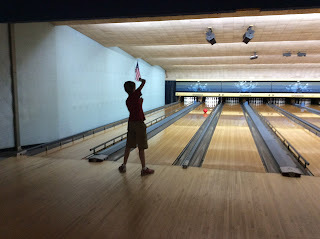 The air-conditioned dimness of a bowling ally soothes you on a glaring 95-degree day. Barbeque smoke drifts around the neighborhood on the evening breeze, and fire works blossom in the darkness from late June thru Mid-July. We each have different visions of what “summer time” based on how, where, and when we were raised. But for everyone I know, there’s something about summer that says let’s have a great time by relaxing and doing something different. Summer slows us down and gives us more time to connect. Rather than seeing kids dashing around in the morning getting ready to head out for the bus, I watch as they leisurely meander in still wearing the same pair of old shorts and a t-shirt from the night before. Even PJs get a break when you stay up late watching a movie because there’s nowhere you need to rush off to the next day. Summer is a great time to learn a new skill or hobby. 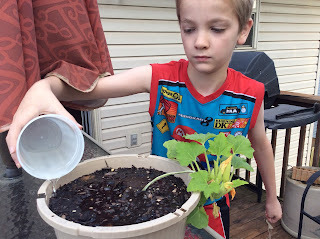 One of my twin sons is trying to grow squash from seedlings he received as a parting gift from school. It hasn’t died yet and a few flowers are opening up to welcome any passing bees. In early June, I finally finished teaching this same son to ride his bike. The last time we tried, he fell off, got scraped up pretty badly, and has been reluctant to try it again since. This time, it took less than 5 minutes before he was sailing along effortlessly as I ran alongside to keep up. I was glad to see him easily get the hang of it, and he quickly left me behind as the sheer joy of speed overcame any last doubts about crashing. July is a great month to remember our nation’s birth. This year I gave my boys an assignment to read the Declaration of Independence, and each of them had to pick out several words or phrases that didn’t make sense so we could talk about them. It did me some good to brush up on it as well. One of my best teachers always said, “You’ll never understanding anything as well as when you try to teach it to someone else.” True enough. August’s dog-days are just around the corner. We’ll beat the heat indoors playing games together. 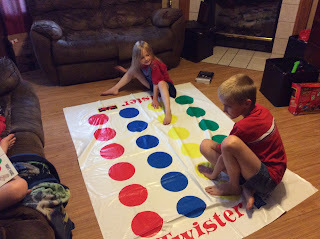 My daughter’s recent favorite is Twister. Part of being a Good Dad has been staying limber enough to keep up with this game. I try to set a good example and can’t whine too much when my ankle ends up beside my head because all the easy-to-reach red dots are taken. Being a Good Dad is a lot of work, and one of the greatest rewards of the job that I’ve found is spending more time with my family, my kids in particular. 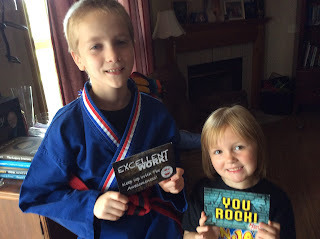 I don’t have any profound or secret advice to my fellow Good Dads other than to remember that Summer is the season for kids to be kids, and I’m blessed that there are plenty of excuses for me to join in the fun. I am another Dad with a dream for my children. What about you? Do you have dreams for your children, too? For all my teasing, I am not dreaming of a bigger, newer sailboat with a roller furling jib, wheel steering, a pressurized water system, and things like this. I am not dreaming about a sailboat. I dream about my children. I dream about their freedom. I dream about their hopes. I dream about their future. I am a Dad with a dream. I dream for my children to have a deep understanding that their freedom does not come at the expense of someone else’s freedom; nor does their hope come at the expense of someone else’s hope. I dream for my children to be happy. I also want them to assist others in their happiness, too. My children’s freedom is not just about them. My children’s freedom comes in the context of community, in the context of other people, with an understanding that we are all free together. For me, freedom is not the right of my children to do whatever they want whenever they want. For me, my children’s freedom is the power and ability to do what is right and to do what they ought. I want my children to know that when their freedom or right encroaches upon the freedom and right of someone else then they are no longer free. Then they are slaves who are oppressed by their own selfish, self – centered and reckless attitudes that will, in time, erode and destroy our community and world. I believe my children’s dream begins with me -- without blame of others, complaint, or excuses. My children’s freedom begins in a home that is free of anxiety and anger, blame and complaint. My children’s freedom begins with me and an understanding that we are all equal and these rights belong in balance and to all of us, not just a few, or some, or the elite. This is my dream and it begins with me. But a roller furling jib would be nice, too!